My big photographic purchase of the year was a Nikon 10-24mm wide-angle lens. I shoot mostly landscapes and there's been a few times in recent years when I wanted a lens that could go wider than the 18-55 lens that came with my Nikon D5000 (since replaced with a D5100 after a little kayaking accident). Shortly after the lens showed up, I drove up to the Eastern Sierra for a couple days day hiking -- including a hike long on my to-do list, the five-mile stomp uphill from Onion Valley to Kearsarge Pass on the border between the John Muir Wilderness in the Inyo National Forest and Kings Canyon National Park. It was a great day. The above photo was taken from the pass shortly after noon -- pretty good light for mid-day thanks to the clouds. Those are the Kearsarge Lakes with the Kearsarge Pinnacles behind them. 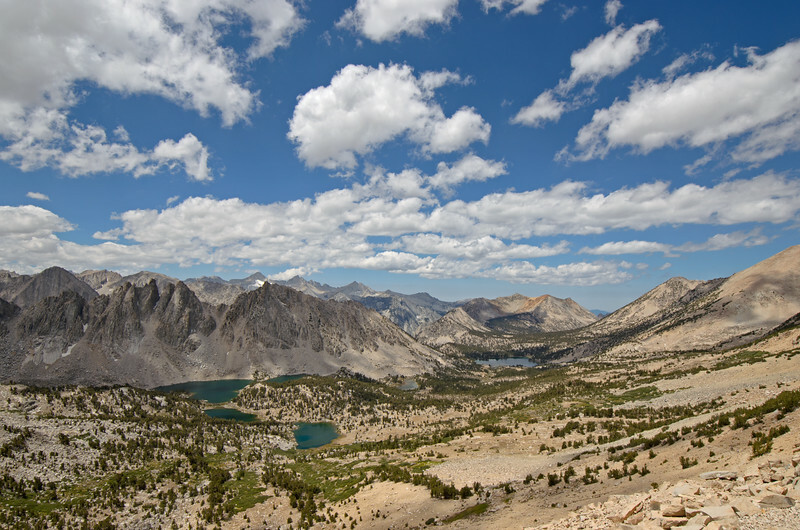 At right is Bullfrog Lake -- the trail down the west side of the pass leads to Charlotte Lake and a junction with the John Muir Trail/Pacific Crest Trail. The bottom photo was taken looking east toward Onion Valley and the Owens Valley. In the spirit of photographic improvement, let's self-critique! In the top photo, I should have taken an extra second to look through the viewfinder as I captured a sliver of the trail in the bottom right of the frame. No huge deal, but somewhat distracting to my eye. In the photo right above, I should have anticipated this shot and found a vantage point that allowed me to get all of the lake in the frame. I really like this photo but I am curious what it would look like with the entire lake and with some sun on the lake to bring out the color. Here's one more--I saw these folks up at the pass while descending the switchbacks and was able to whip out the telephoto lens in enough time to get a shot. I kind of dig it -- the Sierra up this high is really just a big pile of rock with an occasional sprout of vegetation. 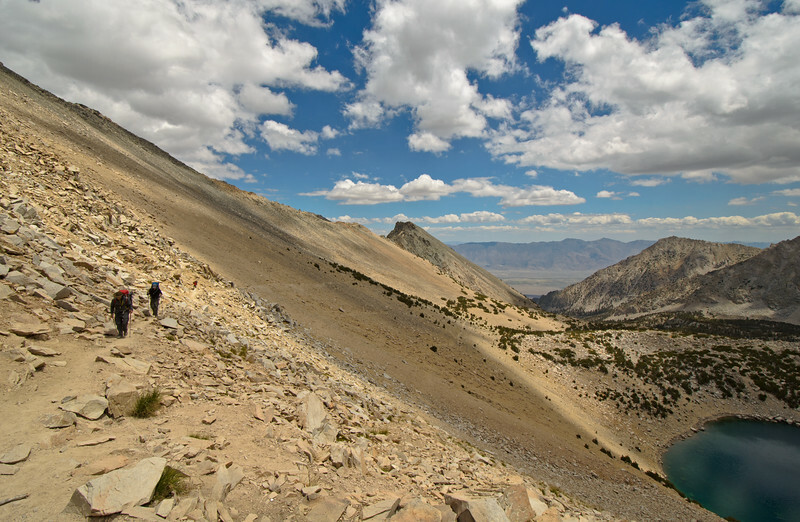 Check out the rest of my Kearsage Pass gallery on my SmugMug site. Feel free to purchase countless copies to cover your entire wall and ceiling, thereby enriching me in the process!